We're the people that invented these simple, effective & affordable Hoop Bending Tools. No one knows more about bending hoops, others simply copy us and follow our lead. GET A FREE HOOP BENDER "SEE HOW"
Hoop to Wood Side Mount "for 3/4" emt"
Securely and quickly mount your 3/4" emt hoops to any wood structure with these side mount adapters. 10 Pack-Black #22 snap on film clamps. The rounded edges of these clamps reduce or prevent damage to the plastic covering when applying and removing. On orders of five or more 10 packs we may be shipped in bulk, loose in a box . 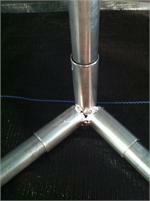 For Low Tunnel hoops made from 3/4" emt tubing. Use these connectors anywhere you need to connect 3/4" emt straight tubing perlins length wise to your 3/4" emt hoops. (screws included). (screws included). 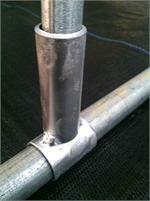 3 way corner for 3/4" emt hoop to base connections, used on all portable low tunnel construction using 3/4" emt. Plastic Snap Clamps for 3/4" emt tubing are used to attach Agribon, Dewitt or Poly covering to 3/4" emt metal tubing hoops. Clamps may be white or green depending on our stock. Four Pack of 3 way corner's for 3/4" emt hoop to base connections, used on all portable low tunnel construction using 3/4" emt. 5 Pack 3/4" cross connectors. 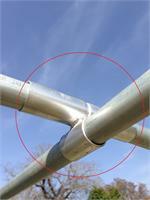 For Low Tunnel hoops made from 3/4" emt tubing. Use these connectors anywhere you need to connect 3/4" emt straight tubing perlins length wise to your 3/4" emt hoops. (screws included). (screws included). 1 Package of 100--- #10 X 3/4' Hex Head self drilling tech screws.